Create the perfect environment and enjoy the peace and serenity provided by the Somfy Sonesse ULTRA 50 DC motor. Compatible with a variety of interior window coverings, it provides superior strength for even the largest of shades. It’s near silent operation creates a relaxing and peaceful environment. This motor is low-voltage so it’s easy to install as well as integrate with home automation systems. Ultra Powerful – Its superior torque of up to 4Nm allows the motor to be installed for almost any application on the market. 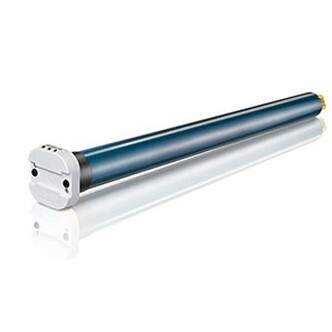 (Additionally, the high torque allows for a single Sonesse ULTRA to multi-band up to six shades). Ultra Quiet – Sonesse ULTRA 50 DC is packed with innovations and patented technologies that provide 4Nm of power and an acoustic performance of less than 38dB- the most powerful and quietest motor on the market. Ultra Flexible – available for a variety of control systems, for all types of spatial configurations in commercial and residential buildings, in both new and renovated projects. Quietly enjoy energy savings, privacy, UV protection. Ideal for nurseries, offices, bedrooms or wherever silence is a must. Market leading strength and silence. Continue your activities uninterrupted at home or work with the peaceful silent operation of motorized applications. Compatible with multiple control technologies so you can operate motorized applications with ease.